Isn’t it amazing how a handful of words can make such a dramatic difference in our day? Such words flow out of courtesy. Courtesy is defined as: the showing of politeness in one’s attitude and behavior toward others. It is derived from the adjective “courteous” which means polite, respectful, or considerate in manner. Although courtesy is essentially non-existent in the slate of reality and politically-slanted television shows that plague our culture, it can be embraced and modeled as a core value in local government. By executive leadership – Those in position of executive leadership should remember to say, “Thanks” as often as an opportunity is provided. If you’re too busy to say, “Thank you” to your support staff, then you’re too busy. By managers – Managers are responsible for encouraging others to work to their full potential. Courteous managers are far more likely to accomplish that. Why? Because a non-courteous manager will probably have fewer workers to encourage. By supervisors – No one is born a supervisor. Supervisors do not develop leadership skills in a vacuum. Remember your pre-supervisor days and those words and phrases that motivated you and those that made you search through job postings. Stay away from the latter when supervising your direct reports. By frontline personnel – By the time many of your customers get to you, they are worn out. No matter what, politeness, respect, and consideration are much more exemplary of the word “servant” in the phrase “public servant” and are much more likely to yield a positive response when dealing with internal and external customers. Try a little experiment. Today, make it a goal to express courtesy to at least ten different people. Do the same thing again tomorrow and the next day. Write the word “courtesy” on a sticky-note and place it on your computer monitor, or on the visor of your work truck. Embrace courtesy as a personal core value even if it is not a stated value within your organization’s core values. Got to run – nine more expressions of courtesy to go :). You can use other words for this reality, but the one that seems to fit best is “bottleneck.” Things slow to a trickle at the bottleneck. Sometimes they completely clog up. This is not good for the health of your organization. Now, a healthy organization knows that getting stuck is indeed likely. Every organization gets stuck. So, what sets the healthy organization above the others? What does the healthy organization do differently, better than the unhealthy ones? They are always looking for the current bottleneck. They identify it. They tackle it, with time and resources and energy, until they unclog the bottleneck — until they get unstuck. And then, after about fifteen minutes celebrating their success, they go to work looking for the next bottleneck. So, if a vital sign of health is “a healthy organization identifies and removes bottlenecks,” then it seems that leaders have to take identifying and removing bottlenecks as a very serious task. There is not a moment to waste. If there is a clog, a bottleneck, if the organization is stuck, you’ve got to get on it and get it fixed now. You are wasting time, losing money, and falling behind your competitors until the bottleneck is cleared. So, where do you look for your bottleneck(s)? The book to start with is the long-time, much-respected best-selling The Goal: A Process of Ongoing Improvement by Eliyahu Goldratt and Jeff Cox. Something is slowing you down — something is causing the bottleneck. You don’t know what this problem is. You don’t know how this problems interacts with other problems. Once you identify it and “fix it,” you have to repeat the process to find the next new problem. And, though you want to identify a machine, a piece of software, something physical/tangible, a person, etc. as the bottleneck, it is very likely that the bottleneck is a process bottleneck. Look for the process bottleneck. The Theory of Constraints (TOC) means: There is a (current) constraint (bottleneck). Find the constraint, fix it, get a better process, then find the next restraint. (“A chain is no stronger than its weakest link”). It seems to me that so many times the thing that holds back the team is the courage of the leader—or more specifically, the lack thereof. I know the leader must have vision, communication skills, interpersonal skills, and many other things. However, no matter how skilled or experienced a leader is, if he/she lacks the courage to lead, then it doesn’t matter what else he/she has to offer. Just the other day, I was reminded of the role of courage all over again. Sitting with a group of emerging leaders, one by one, they shared their frustrations with leadership that lacked courage. One person shared how paralyzing it was for a leader to refuse to make a decision; another talked about what it was like to work with someone who was an obvious poor performer, yet was allowed to continually drag down the rest of the team. Still others spoke about leaders who were indifferent and distracted. In their book Multipliers, Liz Wiseman and Greg McKeown write powerfully about the difference between leaders who see themselves as “genius” and those who see themselves as “genius-makers”. The genius often ends up making people feel diminished and unimportant. It’s demoralizing to others. The same is true for leaders who lack courage. In their efforts to avoid conflict, please everyone, and make themselves look good, their lack of courage becomes demoralizing. So if you are a leader, you need to make sure you have the courage to lead. If not, at least have the integrity to step aside and let someone else. Comfort zone. Those two words, when it pertains to careers and the workplace, make me cringe. To me, it means complacency and—to a certain degree—laziness. When friends complain to me about their situation, I often ask, “Why don’t you try something else?” To which I usually get a response similar to, “Because I’ve been doing it for so long” or “Well, I’m used to doing what I do now”. No matter what the answer turns out to be, the root of it can be pinned to fear. Fear to do something new. Fear to take risks. Fear to get out of a comfort zone. Here’s a newsflash: nearly everything you want is going to be out of your comfort zone. It’s amazing how many people are satisfied with having so many “what ifs” in life. Dreams, goals, and aspirations are not just for college undergrads. You need to keep on achieving in your career also. Keep on setting goals and being the best you can be in the position you currently hold. And if you’re not where you ultimately want to be, take the risks necessary to get there. You are your own worst critic, and unfortunately, you’re also your own worst obstacle in life. People and circumstances aren’t as big a challenge as the ability of the mind to psyche you out of what you want to do. So the next time fear rears its ugly head and gets in the way of your success, ask yourself what you’re really afraid of. Is it even a valid fear? And could you live with yourself if you let that fear win? In those two statements, Carl had summarized the two biggest reasons that teams don’t experience the benefits that come from robust dialogue: pride and insecurity…or is it just insecurity? How does someone rise to the level of being the head of a department in an organization? Usually he or she has spent years becoming an expert in that particular area. He has learned from the experience of successfully launching and completing multiple projects. She has stayed current on cutting-edge research and technology, and has possibly even published papers within that arena. We are a nation of specialists. So, when the team leader suggests that, as an executive management team, they need to engage in more debate about ideas, projects, issues, and conflicts, it just seems to fly in the face of conventional wisdom. So, how does a leader lead the team to get the most from constructive conflict without it becoming destructive? Emotional Intelligence. This is a broad category because it relates to recognizing one’s preferences in areas such as communication, conflict, receptivity to new ideas, vision, focus, and many other things, as well as understanding the nuances of healthy relationships. However, for teams to be effective in debate, the leaders on that team must possess a high level of emotional intelligence. This is true for both when the discussion is centered on their area of expertise and when it’s not. Set the Example. If the leader is willing to let his/her ideas be critiqued, adjusted, or even tabled, then it sets the example that this really is going to be a team that values honesty and input. However, if the leader becomes defensive when his/her ideas are criticized, or if the leader resorts to sarcasm as a way to “get back” at the one who dares to question his/her idea, then the chances of building a true culture of robust dialogue are slim and none. Build Strong Relationships. At first, this appears to be counterproductive. One reason Carl didn’t want to critique ideas from Robert was because of respect and friendship. They genuinely respected each other too much to criticize one another. Do strong relationships create an impasse to cutting-edge debate? No, but to move beyond that perception requires time, patience, some damage control, and a lot of time spent together outside of the obligatory meetings. This past weekend, the world witnessed one of the most spectacular rounds of golf in the history of major golf championships. Phil Mickelson shot a 66 in the final round of the British Open and won the tournament by three strokes. He played brilliantly, birdieing four of the last six holes. When the final putt dropped on number 18, Mickelson raised his arms in triumph, embraced his caddie, and then walked off the green and into the arms of his wife and three children. He had done it. He had claimed one of the most prestigious titles in all of professional sports. The announcers were beaming. The crowd was cheering wildly. Cameras were capturing a win for the ages. Champions have a coach. Butch Harmon has been Mickelson’s coach since 2007. Harmon has coached other greats like Tiger Woods and Greg Norman. Do you have a coach? Is there another set of eyes on your work? Are you open to suggestions regarding work habits, areas of improvement, etc.? Champions continuously improve. Phil Mickelson credits a new three wood in his bag as a game changer. He had won tournaments in the past with other clubs, so why change? He changes because he understands the importance of constantly evaluating equipment and leveraging new technology to his advantage. Do you take time to evaluate ways to improve? Are you successfully leveraging technology to save time, money, and other resources? Champions have great team members. Phil has had the same caddie for 21 years. While technology can be tweaked and leveraged, people can be one of our most valuable constants. Who is walking beside you offering counsel and encouragement along the way? Who provides the steady voice and consistent presence that reminds you to stay focused on desired outcomes? Champions know the power of practice. Mickelson commented after the victory that he had been working harder than ever to achieve this goal. Obviously, his hard work paid off. What and how do you practice? How do you transfer that into desired outcomes? Only a handful of individuals will ever be crowned British Open champions. However, all of us can imitate champion habits and become workplace game changers. “Every man must decide whether he will walk in the light of creative altruism or in the darkness of destructive selfishness.” – Martin Luther King Jr.
Adam Grant, who is kind of our new guru on giving as a way of constructing and conducting business, has an op-ed in this week’s New York Times: Why Men Need Women. This is a really provocative article! Here’s what he says. (I’m going to summarize in my words). Men are selfish. Men are naturally selfish. They have to be pushed, led, cajoled to even think of others — to be less selfish. And it takes a woman (or, maybe a girl) to accomplish this superhuman transformation. CEOs are among the most selfish. Especially male CEOs. (And, by the way, in case you have been living in a cave, males make up the vast majority of CEOs). And this selfishness has serious implications for pay scales, compensation, and many other factors giving shape to our economic, and civic, realities. What makes some men miserly and others generous? What motivated Bill Gates, for example, to make more than $28 billion in philanthropic gifts while many of his billionaire peers kept relatively tight-fisted control over their personal fortunes? …New evidence reveals a surprising answer. The mere presence of female family members — even infants — can be enough to nudge men in the generous direction. …But there was a twist. When Professor Dahl’s team examined the data more closely, the changes in pay depended on the gender of the child that the chief executives fathered. They reduced wages after having a son, but not after having a daughter. Daughters apparently soften fathers and evoke more caretaking tendencies. The speculation is that as we brush our daughters’ hair and take them to dance classes, we become gentler, more empathetic and more other-oriented. …It’s often said that behind every great man stands a great woman. In light of the profound influence that women can have on men’s generosity, it might be more accurate to say that in front of every great man walks a great woman. If we’re wise, we’ll follow her lead. Here is my observation. We all need someone to lead, nudge, push, and cajole us to do what we should be doing anyway. In other words, it would help if we had all married a good woman, or fathered a girl who became the kind of woman represented by Melinda Gates. Is this the end game of doing more and more with less and less? Or is it the inevitable result of “Urgent Creep”? Urgent Creep is the process that takes place when more and more urgent things insert themselves into the leader’s schedule until he or she has no time to do anything that isn’t a dire emergency. When that happens, it leaves the leader exhausted, frustrated, and unable to focus on anything that doesn’t have to be done now. One problem with that is that the future, by definition, rarely demands to be dealt with right now. Yet, the question is what happens if the leader is not planning for the future? If the leader is not planning for the future, who is? If leadership is about the future, then urgent creep can mean that no one is really leading. Self-define yourself as a Futurist. This means that you see yourself as having an important role in preparing your organization for the future. If you don’t see yourself as a futurist, it is doubtful that you will make casting a shared vision a priority. Constantly ask yourself, “What am I doing that I should be managing?” There’s a huge difference. One way to battle urgent creep is to regularly examine your workload to see what can be delegated to others. You don’t do this so that you will have less to do. You do this so that you will have time to do what only you can do. Lead. Resist the urge to micro-manage. The benefits of delegation can be eradicated when the leader insists on micromanaging what has been delegated. Micromanaging eats up all the time for leadership that would have been created through intentional delegation. Select good people, train them, and then empower them and trust them to do the job. Breaking free to lead takes discipline and cannot be accomplished overnight. However, relentlessly following these steps may be the only way that you will truly find time to lead. In news, people thought I was crazy because I’d watch every newscast from the competition, as well as the other newscasts from my own station. Yes, it was a very tedious practice; but I always knew what was going on, which station did what, and whether the way they presented the story was effective. It helped me produce a newscast that I knew was up-to-date, catchy, and informative. Sometimes there would be an idea thrown around the newsroom about how to tell a certain story, and I could chime in with my concerns because I’ve already seen the concept bomb on another station. That’s not to say that I’ve never made mistakes on-air. But I definitely limited the number of mistakes by learning from others. Leaders are constantly learning—through books, seminars, experiences, etc. That’s nothing new. There are plenty of posts on this very blog that share the same sentiment. 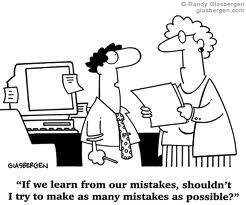 But what is sometimes not reiterated enough is how leaders not only need to learn from their own mistakes—but the mistakes of others. In local government, it’s easy to get too consumed with what your organization is doing and not care about surrounding or similar entities. However, paying attention to those other entities could help you determine what works and what doesn’t. I’ve seen several departments from different areas try to launch the same program with the same depressing outcome—a direct result of not keeping an ear to the ground. And on a more personal level, it’s just smart to not have to repeat mistakes others have made because it will save you a load of grief. Avoiding Conflict: Yes or No? We all know that conflict is a part of leadership, but I don’t know many good leaders who relish conflict. Effective teams experience conflict because it’s impossible to reach important and challenging goals without conflict. Of course, if you like conflict too much, it raises some red flags, and we become a little concerned about you. Nevertheless, if you cannot become adept at successfully handling conflict, it will be a definite hindrance to you as a leader. Too many leaders rely only on “avoidance” as a way to deal with conflict. We try to avoid conflict when we ignore the problem, procrastinate, or try to shift responsibility to someone else. At first glance, this may always seem like a bad approach; however, there may be times when avoidance is a great approach! For example, if someone demands to have an immediate meeting with you over a complicated issue, it may be wise to put that meeting off until you can be properly prepared. In a similar way, seasoned leaders learn that not every conflict deserves attention. Some of them will burn themselves out for a lack of oxygen. As was said about Phil Jackson in Eleven Rings, “No one does nothing better than Phil.” Overly-eager leaders can be too quick to solve every problem and address every issue. Sometimes, that pressure can come from others who loudly demand, “You have to take a stand. You have to do something!” Sometimes they are right, but many times, their advice is driven by their own agenda. Confidence: Your team may lose confidence in your courage and/or your leadership because you don’t take action. As a leader, you have to know when it’s time to take action. Complications: A bad problem may get worse and become even more complex because it is not confronted in the right way at the right time. This is what leads to rampant dysfunctional patterns within an organization. Conflicting Solutions: Sometimes in the void of your leadership, other people will create solutions. At first, you may be glad about this, but you may discover that the solutions that others propose or create may conflict with other objectives you have. They may even solve one problem only to create three new ones. Avoidance is not a good default approach for conflict. If you choose to use it, there needs to be a good reason, and you need to be able to articulate those reasons.